Set in the picturesque location of Bavaria is one of Germany’s largest watch manufacturers called Point Tec. Wilhelm Birk established the group in 1987 and now owns several labels, including Zeppelin. What distinguishes them from many of their competitors is a meticulous attention to detail. All of the timepieces they produce display a certain degree of maturity and are exceptionally well made. Here are five of their fantastic watches that perfectly illustrate this point. The Flatline is one of Zeppelins latest and most exciting designs. Dimensionally the watch has a classically proportioned 316L stainless steel case measuring 40mm x 12mm. What makes this timepiece so distinctive is the cool black dial with discreet white markers. Other features include a small GMT sub counter and retrograde power reserve. Powering the watch is a refined 26-jewel mechanical self-winding movement. 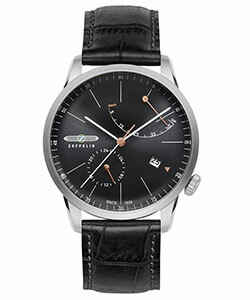 The 100 Years from Zeppelin is an elegant and affordable pilot style watch. This timepiece has a modest size 316L stainless steel case measuring 42mm x 11mm. What makes the watch so appealing is the highly complicated two-tone black and white dial. Other fine details include a Pulsometer scale and large day/date indication. Beneath the refined exterior lies a Swiss made Ronda 5020.B quartz movement. Get the 100 Years here. The LZ127 from the Count Zeppelin series of watches has a high-quality appearance. With a 316L stainless steel case measuring 40mm x 12m the timepiece should appeal to the unisex market. What makes this watch so special is the stylish open-heart beige dial. Other important characteristics include large black numerals and elegant hour/minute hands. Beneath the timeless façade lies a mechanical self-winding movement. Get the Count Zeppelin LZ127 here. 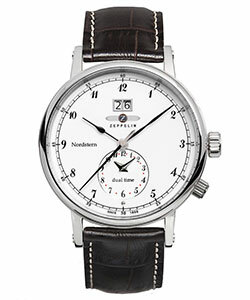 The Zeppelin Nordstern is a really well made and affordable dress watch. Dimensionally this model exudes traditional proportions and has a 316L stainless steel case measuring 41mm. What makes this timepiece so attractive is the sophisticated white dial with contrasting black numerals. Other features include delicate hour/minute hands and dual time display. Powering the watch is a Swiss made Ronda 6203.B quartz movement. 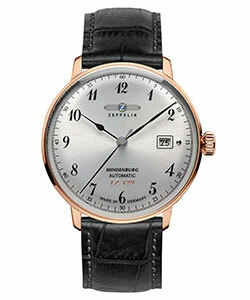 The Zeppelin LZ129 Hindenburg has a timeless and classical charm. This watch should appeal to a wide variety of discerning buyers and has a 40mm stainless steel (rose gold coated) case. 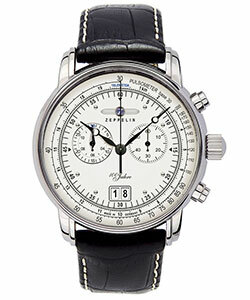 What makes this timepiece so enticing is the high-quality silver dial with black numerals. Other details include intricate black hour/minute hands and small date indication. At the heart of the watch is a 24-jewel mechanical self-winding movement. Get the LZ129 Hindenburg here. 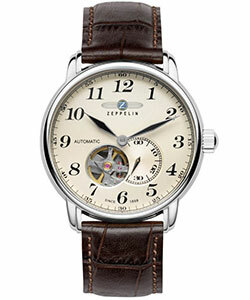 Find the right watch for you, see our full range of Zeppelin watches.